The ITGS topic 3.11 Robotics, artificial intelligence, and expert systems is a great opportunity to get students involved in fun, creative practical activities while learning exactly how robots are created and programmed. Robots themselves are often expensive, but simulated environments are a good option to give students useful experience with less outlay. Whichever path you choose, the experience students gain here can be applied to real robot examples and help students understand the challenges robotic creators face making machines that interact with the real world. Here are three great tools for practical robotic activities in the ITGS classroom. 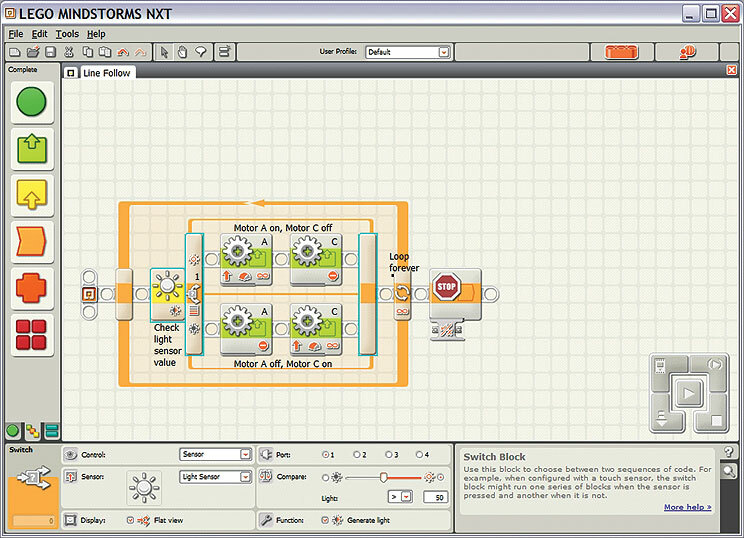 RoboMind is a robot development environment that includes a basic robot simulator. The robot is programmed in a very simple language (not unlike Logo) using commands such as forward(), right(), and left(). The robot can interact with its environment by painting a white line in its current position (the paintWhite() command) and picking up or dropping a “beacon” object (pickUp() and putDown()). It is also possible to sense the environment around the robot using commands such as frontIsClear() and leftIsClear(). RoboMind can serve as a useful introduction to robotic programming, and help students to understand how the “intelligence” robots display is achieved (the Maze finder algorithm is useful for this). ITGS students might find it a bit simple, and it should not take them long to exhaust its possibilities. However, one of its saving graces is the ability to export the completed code to the Lego Mindstorms robots (it works with the default Lego robot built out of the box). Students can test their initial code using RoboMind and then test it on the real robot once they are relatively confident it will work. This is very useful if you have a lot of students and few Lego robots! RoboMind is free for personal use; there is a small licence fee to pay for educational use. Karel is a robotic environment that offers a lot of similar functionality to RoboMind – there are commands for moving, turning, and placing and retrieving beacons. However, because Karel is programmed in Java (the basic robot commands are just Java methods), there is a great potential to expand the tool with new functionality and methods. Don’t let the black and white screenshot put you off – Karel has great potential as a robotics tool and there is quite a lot of useful documentation on it out there – include lesson / lecture notes from Stanford. The downside with Karel is the somewhat complex setup procedures and the slightly less forgiving code environment (the Java compiler can throw out some terse errors). Karel is probably best suited to teachers who have experience with configuring Java environments and/or students who have some existing programming knowledge. Karel and its support material are free to download and use. In many ways the Lego Mindstorms robots are the “ultimate” robotic teaching tool. Coming with a variety of sensors (ultrasonic, touch, and colour are in the box, and many more are available separately), three output motors, and a dedicated computer “brick”, these kits really do allow for robotic creations limited only by your students’ creativity. The robots are programmed using a graphical interface (similar to the Scratch programming language) and programs are downloaded to the computer “brick” using a standard USB cable. There are also unofficial development environments that allow code to be written in other languages. I introduced my students straight into NXC (a C like language that can export code directly to the robots) without problems. With several tasks of different difficulty set up, even students with no programming experience were able to write working code quickly. Instructions are included for five robots, and a colourful paper test mat is available to test robots in a series of challenges (I would have preferred this test mat to be made of a sturdier material than strong paper really, but it works OK). As with all Lego products, the build quality is second to none. Another bonus is the wide range of support available from the Mindstorms community – there are numerous web sites, blogs, and books dedicated to the robots in general and using them in education in particular. Teachers should be able to find building instructions and lesson ideas for just about any occasion. The downside, of course, is the price – at over $250 for a single robot pack, it will take quite an investment to equip a class. Nevertheless, the robots are an investment that should last for a long time and, if properly managed, allow more freedom and creativity than any of the other options here.